A locomotive derailed in Kingston yesterday while hauling almost 100 oil tanker cars, which were empty at the time of the derailment. Oil companies are using outdated tanker cars and Hudson River barges to move oil coming from North Dakota’s Bakken oil fields. Wigwam has been reporting Riverkeeper’s efforts to keep the barges and rail cars from operating until it can be proven they are safe. 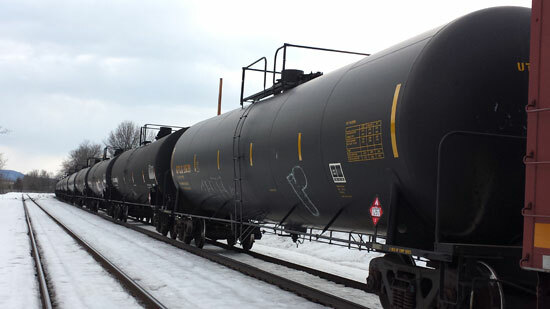 Even oil transported by train runs the risk of being dumped into the Hudson during an accident. “We thought July 2010 was awful, but it’s something that just keeps on giving,” said Deb Miller, a resident of the riverside village of Ceresco. Miller took an Enbridge buyout of the building and property where her carpet store once stood along the river. “The Realtors all told me that is a doomed property; I’d never be able to unload it,” she said. Her business was closed for three months before the buyout, and Miller said she had to hire an attorney to negotiate terms. She still lives nearby on the river and said she’s endured three years of helicopters, noisy airboats and cleanup crew members yards from her house. Global Partners, one of the largest petroleum distributors in the Northeast, wants to expand its capabilities at the Albany port, and build large boilers to heat the tight oil from the Bakken play so that it can be more easily offloaded from the trains onto the barges. Tight oil is extracted with the same kind of hydraulic fracturing as shale gas. The oil is fairly thick, and appears to be much more corrosive and flammable than other oils. If spilled, it sinks to the bottom of the river and coats everything on the river bottom. These qualities make it is similar to oil derived from the Canadian tar sands that leaked into the Kalamazoo from the pipeline. It’s apparent that we’re not going to stop burning oil until we can’t afford to extract it any longer. But the irony here is that by some estimates, the Bakken play will peak in the next year or two, by 2020 at the latest, Once this particular pool of oil is burned up, there will be no more need to use the Hudson like a vein delivering a dose of drug. Like a soldier shot an hour before the war is declared over, do we want to risk the Hudson River taking one for Team USA? Do we want to allow the river to become a virtual pipeline for some of the world’s dirtiest oil so that companies like Global Partners can make money for the next few years from oil squeezed from stone? You can imagine what will happen if a spill occurs toward the end of that down and dirty final party, when all the distributors are ready to fold the tents and head for the hills. Guess who will pay for the cleanup, who will live with the consequences after last call? Riverkeeper is mounting a form letter campaign to various decision makers at the New York State Department of Environmental Conservation, and every bit helps. Here’s a question worth pondering, though—What would Pete do? What if Beacon’s city council passed a resolution banning any barges from docking at its harbor? After all, Beacon has banned the transportation of fracking fluids on city streets. Of course, we don’t own the river (and neither do the oil distributors) and we don’t have a harbor that could handle a barge, and it would have no reason to dock here, so it would be a purely symbolic gesture. But perhaps, coming from Pete Seeger’s home on the Hudson, it might give pause for thought at the DEC. Feature photo by Chad Gomes, Riverkeeper member. I find all of this terrifying.